In Morroc Town, exit at the top left corner of the map to get to Morroc Ruins. 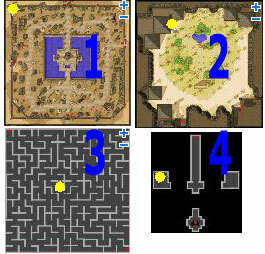 From there, go to top left again to get into the Pyramid Dungeon, walk to the center of the map, go downstair and go into the room at the left to sign up to the Morroc Thief Test. You have to talk to Irrelevant Man to get warped to Shibu's Farm. Notice you have to die in order to get out of the farm. Tips: You may want to take off your weapon to attack faster. He will see if you have enough points to pass the test depending on how many mushrooms you collected. If you pass, he will change you to a thief. He will also give you a little reward for stealing the mushrooms when you pass the test.